This book explores speakers’ intentions, and the structural and pragmatic resources they employ, in spoken Arabic – which is different in many essential respects from literary Arabic. 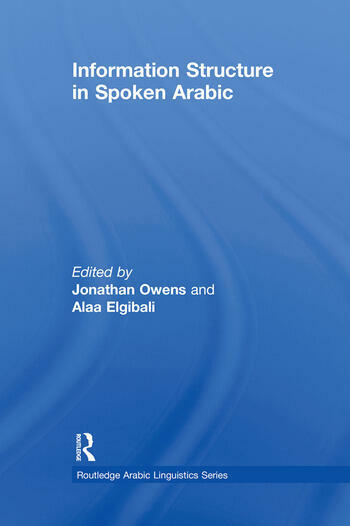 Based on new empirical findings from across the Arabic world this book elucidates the many ways in which context and the goals and intentions of the speaker inform and constrain linguistic structure in spoken Arabic. This is the first book to provide an in-depth analysis of information structure in spoken Arabic, which is based on language as it is actually used, not on normatively-given grammar. Written by leading experts in Arabic linguistics, the studies evaluate the ways in which relevant parts of a message in spoken Arabic are encoded, highlighted or obscured. It covers a broad range of issues from across the Arabic-speaking world, including the discourse-sensitive properties of word order variation, the use of intonation for information focussing, the differential role of native Arabic and second languages to encode information in a codeswitching context, and the need for cultural contextualization to understand the role of "disinformation" structure. The studies combine a strong empirical basis with methodological and theoretical issues drawn from a number of different perspectives including pragmatic theory, language contact, instrumental prosodic analysis and (de-)grammaticalization theory. The introductory chapter embeds the project within the deeper Arabic grammatical tradition, as elaborated by the eleventh century grammarian Abdul Qahir al-Jurjani. This book provides an invaluable comprehensive introduction to an important, yet understudied, component of spoken Arabic. Introduction: The once and future study of information structure in Arabic: from Jurjani to Grice - Jonathan Owens. 1: Explaining null and overt subjects in spoken Arabic - Jonathan Owens, Bill Young, Trent Rockwood, David Mehall, Robin Dodsworth. 2: Word order and textual function in Gulf Arabic - Clive Holes. 3: Information structure in the Najdi dialects - Bruce Ingham. 4: Word order in Egyptian Arabic: form and function - Malcolm Edwards. 5: The information structure of existential sentences in Egyptian Arabic - Mustafa Mughazy. 6: The pragmatics of information structure in Arabic: colloquial tautological expressions as a paradigm example - Mohammed Farghal. 7: From complementizer to discourse marker: the functions of ’inno in Lebanese Arabic - Marie Aimée Germanos. 8: The (absence of) prosodic reflexes of given/new information status in Egyptian Arabic - Sam Hellmuth. 9: Moroccan Arabic—French codeswitching and information structure - Karima Ziamari. 10: Conversation markers in Arabic—Hausa codeswitching: saliency and language hierarchies - Jonathan Owens, Jidda Hassan. 11: Understatement, euphemism, and circumlocution in Egyptian Arabic: cooperation in conversational dissembling - David Wilmsen. Jonathan Owens is Professor of Arabic Linguistics at Bayreuth University, Germany. He has published extensively on many aspects of Arabic linguistics; his most recent publications include Arabic as a Minority Language and A Linguistic History of Arabic. Alaa Elgibali is Professor of Arabic and Linguistics at the University of Maryland, USA. He is the author of several seminal publications, including Arabic as a First Language: A study in language acquisition and development, and is associate editor of the four-volume Encyclopedia of Arabic Language and Linguistics.